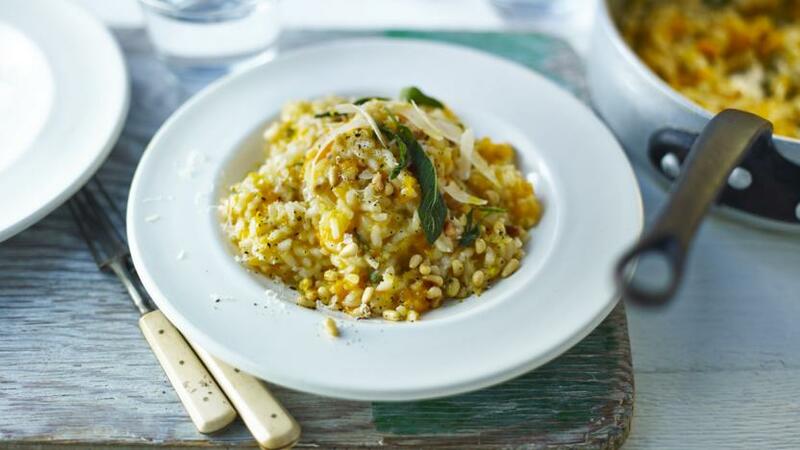 Butternut squash and sage is a marriage made in heaven as this simple yet flavour-packed risotto shows. Cut the butternut squash into 6-8 wedges, remove the seeds and place in a roasting tray. Pound or chop the garlic and add a generous glug of olive oil, half the sage leaves, sea salt and pepper. Tip into the tray and rub over the butternut squash with your hands. Roast in the oven for 40-50 minutes until softened and becoming golden in colour. Once the squash has cooked, cool slightly, then scrape the soft flesh away from the skin into a bowl. Lightly mash with a fork or potato masher until it is fairly chunky in texture. Scrape any sticky juices left in the roasting tray into the bowl and keep warm while making the risotto. Heat the olive oil and a good knob of butter in a deep, heavy-based frying pan or saute pan. Gently fry the onion until softened. Add the rice and stir for about a minute until the grains are coated with the oil and butter. Pour in the wine and stir continuously until it has cooked into the rice. Add a good ladle of hot stock and the remaining sage and season well with salt and pepper. Turn the heat down so the stock is simmering gently. Keep adding ladles of stock as it cooks into the rice, stirring and moving the rice around in the pan. After about 15-20 minutes the rice should be soft but still have a bit of bite left in it. The texture of the risotto should be thick and creamy, but not too loose. Add extra stock if necessary. It may seem tedious standing and stirring but the end result will be worth it. Remove the pan from the heat and gently stir the roasted butternut squash into the risotto with the parmesan, the remaining butter and seasoning to taste. Add any extra stock if the risotto seems particularly thick. Cover with a lid for a couple of minutes as this will give the risotto an even creamier texture. During this time, place the pinenuts in a fairly hot frying pan and toss around until golden. Spoon the risotto into warmed bowls and scatter with the pinenuts and extra parmesan. For a smoky finish to the risotto, fry 6-8 slices of smoked streaky bacon cut into thin strips or 200g/7oz lardons until crispy and scatter over the risotto with the pinenuts.